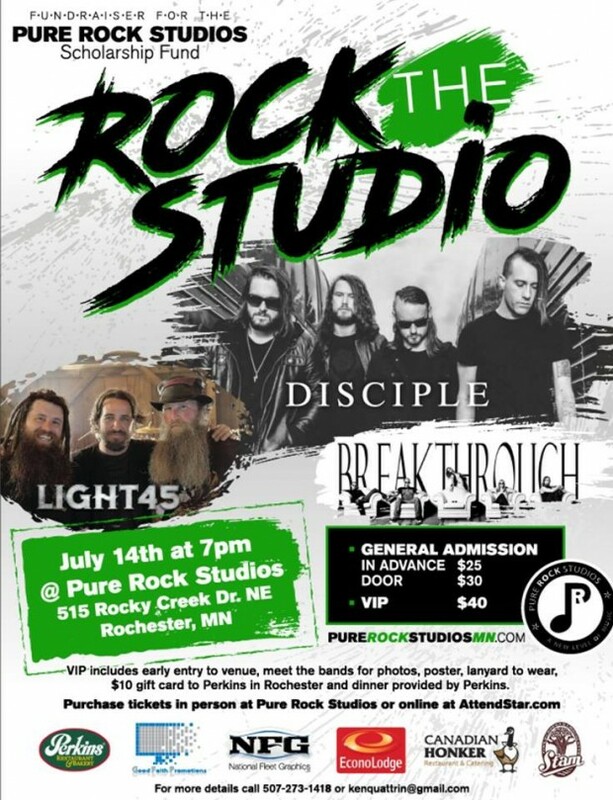 Good Faith Promotions is proud to announce this summer bash with Disciple, Light45 and Breakthrough. The show is also a fundraiser for Pure Rock Studios Scholarship Fund. Help give the gift of music for those struggling to afford lessons. We ONLY have 150 tickets to sell so get yours now. HUGE thanks to all our sponsors! Get General Admission for $25 or VIP for ONLY $40. VIP includes early access to the show, meet the bands for photos and autographs, concert poster, lanyard to wear, $10 gift card to Perkins and a dinner from Perkins day of show. VIP ARRIVE AT 4:00. Call 507-273-1418 for any questions.